California experienced some corporate-free progressive electoral victories in the 2018 primary season and we should all focus our efforts on bringing corporate-free progressive candidates and progressive ballot measures into a full victory come November. Yet it must be said that overall the CA primary did not yield the uplifting electoral results that many of us had hoped for. The good news is that many of us are clear that winning elections is only part of the needed work ahead. It is largely thought that by participating in the electoral process we can change and improve our lives. This is only partially true. We all know that the electoral process is set up against the interests of working people. The electoral process allows candidates to be bought and creates a pseudo-democracy, a fake-democracy, in which most elected officials end up doing what their corporate funders want,and play the ?reform-game? (changing/improving minor aspects of life to keep a system going that is rotten to the core by greed, economic inequality, social oppression, environmental destruction and permanent war.) Elections are important opportunities, however, to organize and develop power for working families and take power away from the 1% oligarchs that rule. Participating in elections needs to be essentially about developing working people power and the role of anyone elected by working people must be to accumulate more power for working people. Only an enormous accumulation of power in the hands of an organized working class will allow us to resolve our problems and survive and do well. It will happen, hopefully in time. (Not too many centuries ago it was unthinkable that the all powerful monarchies would be toppled and abolished. Most are gone. Perhaps corporations will be someday soon be ?abolished?, or at least pushed back to their ?only temporary? status.) As true progressives, our most important role in 2018 post-primary California must be to assure that the momentum for organizing working people continues and that our movement grows to its fullest potential. That means looking beyond party affiliation. Today working people in our state are of various political persuasions. They are registered to vote in various political parties or are registered No Party Preference (NPP). NPP is now the second largest category of voter registrations (2nd only to Democrats) in the state numbering nearly 5 million voters. A corporate-free alliance of progressive groups and individuals based on shared values and vision, regardless of party affiliation or no affiliation, offers a way forward. 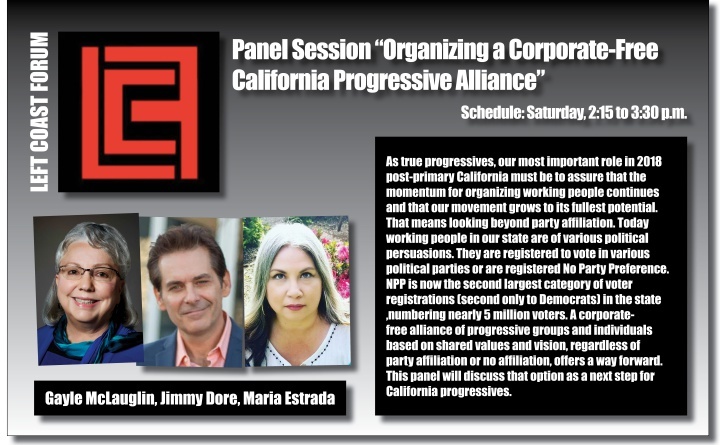 This panel will discuss that option as a next step for California progressives.